I had forgotten how quickly a simple 5 pattern piece garment can come together…. and is there anything more frivolously fun than sewing a dress for a special occasion? I savoured making this dress, as this wedding I wore it too is probably the last I’ll get to attend for a very long time. The dress is Marfy 3453 – a fairly simple fit and flare sleeveless dress. 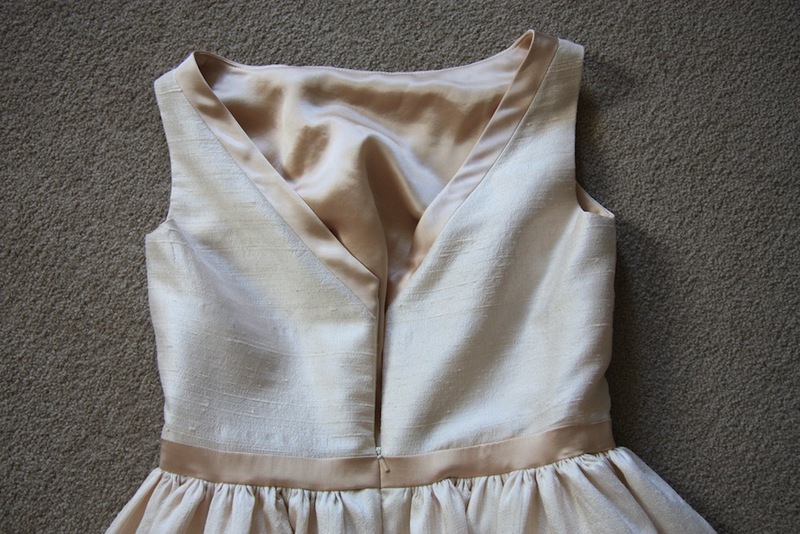 The bodice has two darts, a v-neckline at the rear, centreback zip and evenly spaced pleats in the skirt. I think what I love most about simple patterns is that they really allow your fabric to shine. I had wholly intended on sewing this dress ‘as it is’, but I quickly discovered that a 2 dart bodice on me just looks not-nice. Perhaps its the ratio between my bust and my waist? So I converted it to a four dart bodice. This was the only fit adjustment I made. Also, I had wanted to use the lace border detail on my fabric around the hem, which meant I replaced the pleated A-line skirt with a simple dirndl. I was a little sad about this as the A-line looked great in my muslin, if a little long. I don’t have the amazonian length pins Marfy designs for! Although… I’m very close to a tipping point for preferring a pencil skirt over a voluminous skirt. I’m not there yet, but can see it looming on the horizon. I can see myself wearing this particular dress in my later years as a fitted sheath style, which would be quite easy to achieve. I decided to prewash the fabric, so I could launder the dress myself instead of having it dry cleaned. As soon as I dipped it in water – it STANK. Thanks to an instagram conversation, I was informed that sometimes silk does stink, and it has to do with a gum residue the silk worms leave behind called ‘sericin’. The less processed the silk is, the more likely it to smell, apparently. I was then informed by a google search that you can just keep washing it until it comes out, which it did. Thank goodness. The dress is underlined (organza) to give the fabric some more body, and lined at the bodice in a matching but slightly darker silk charmuese that was also used as the contrast trim around the neckline and waist. This was a stash fabric that just happened to look rather lovely against the raw silk. Whilst sewing I kept the seam allowances large – I want it to be a wearable option for many years to come, so I look at those seam allowances like an insurance policy. You don’t intend on using it of course, but it’s there just in case it’s needed. 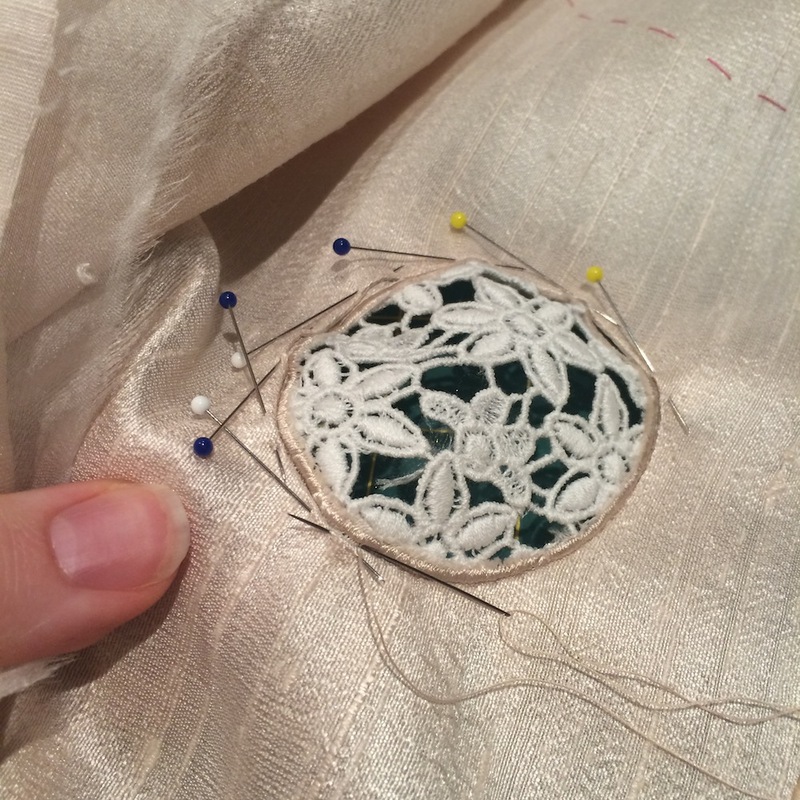 I wanted to try and work in a bit of the embroidery into the bodice, so I appliqued a small lace circle in. Cutting into the bodice fabric to do this was a moment of terror; not having appliqued before! 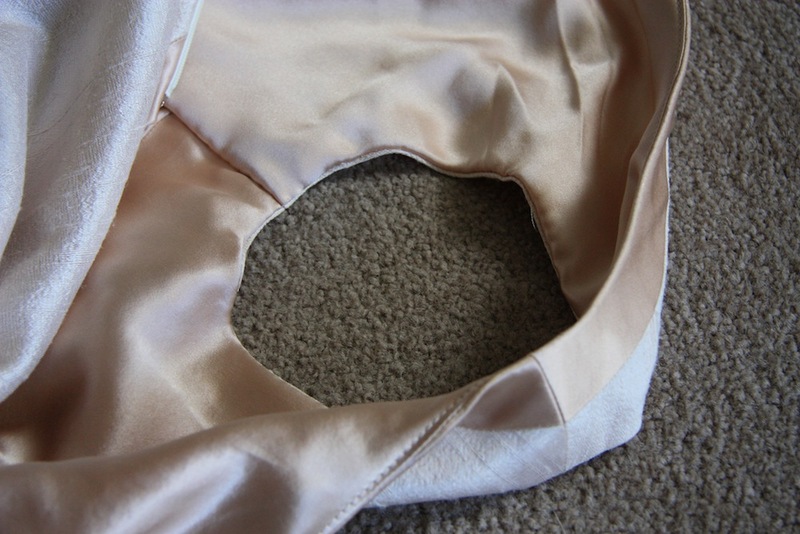 I treated it a bit like a welt pocket – sewing a scrap of organza onto the front with my machine’s smallest stitch, cutting into the circle then turning the organza to the wrong side and ironing flat. Getting the circle to be the right size was the hardest part – it took me two goes. 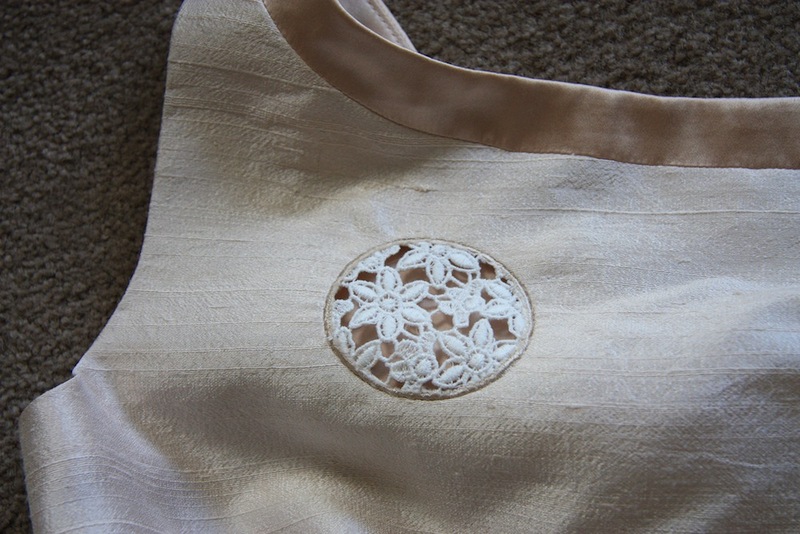 After that I hand sewed the lace circle in with a fell stitch and pressed again. Pretty happy with how it looks! The skirt is one single piece of fabric, gathered. 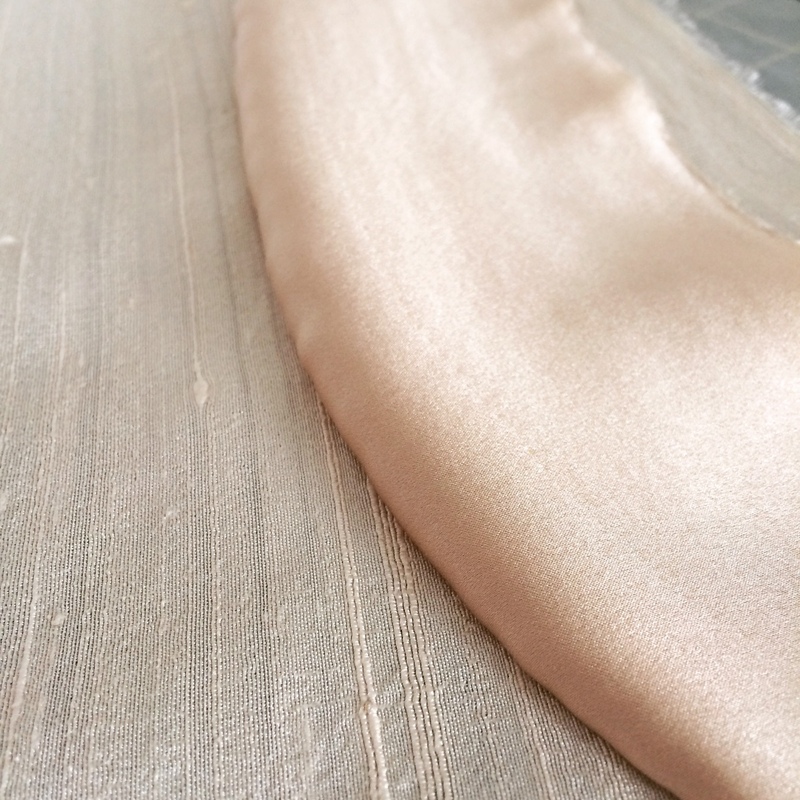 I was basing the length of the skirt off one of my most favourite dresses – and realised that the height of the cutouts would potentially make my underwear visible… so I added in an additional layer of organza. If you looked really close and really hard, and if I had fluoro underwear on, you’d probably be able to see it. Eh. I had a first attempt at lace matching down the back centre seam, and am very happy with the results. The main challenge was that the circles were not perfectly circular. 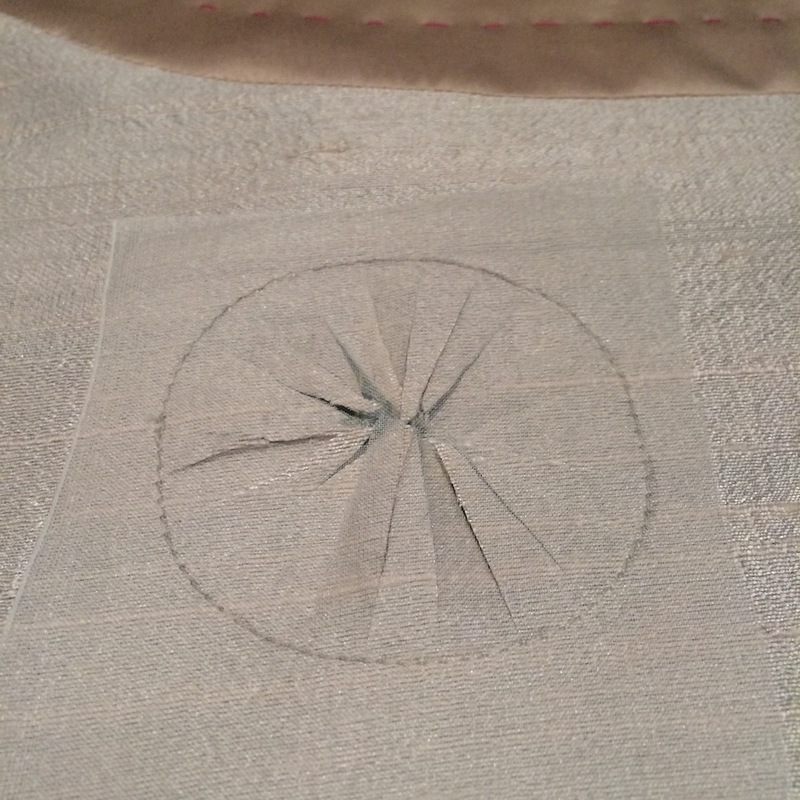 For the hem, I folded it over, sewed it down to itself, then catch stitched that to the underlining. 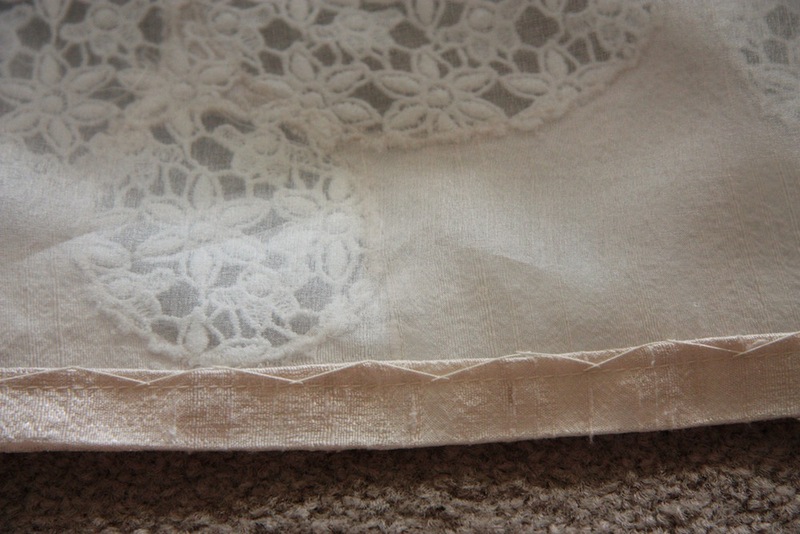 The result is a soft hem that has a tendency to crease in on itself, but I don’t mind the effect so much. Even with the underlining, the raw silk isn’t really interested in being pressed – it will hold the shape, but it won’t be crisp. Due to wanting this dress to be easily adjustable, I machine sewed the lining to the neckline, but hand sewed the arms, down the sides and around the waist. 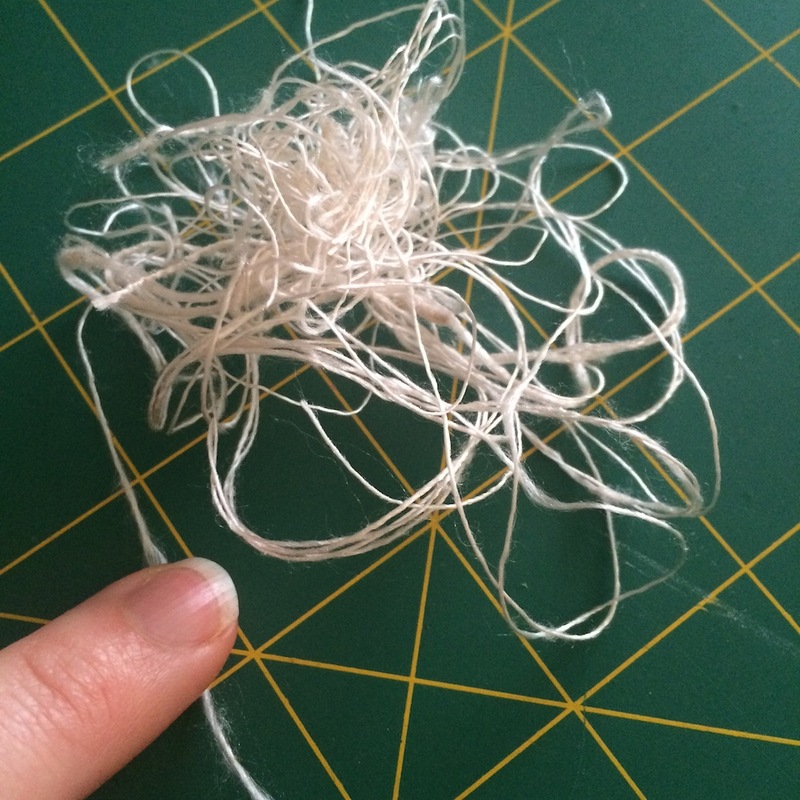 I like hand sewing, and it’ll be really easy to unpick. 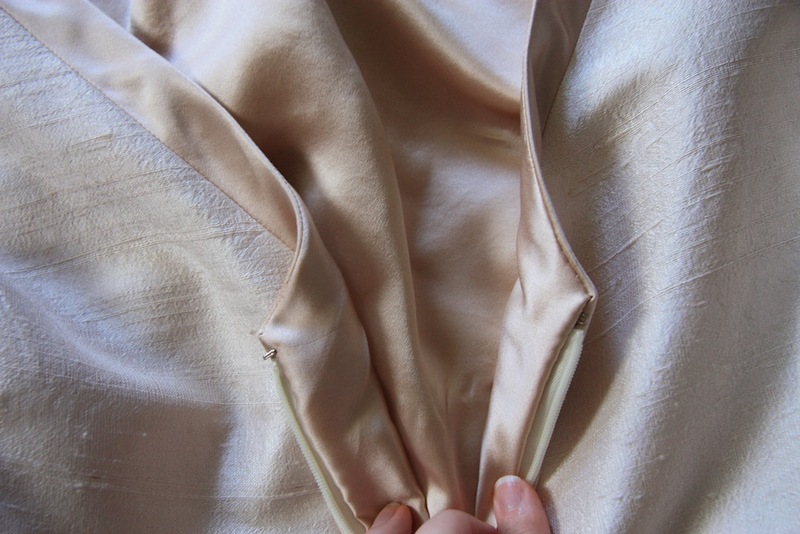 I also just love the loft of silk charmeuse, and hand sewn seams seem to bring that out. Look at that loft… The most accurate representation of the two colours together. And you get a really good eye of the texture of the raw silk! Delicious stuff. I included a hook and eye at the top of the centre back seam, to get a nice closure. 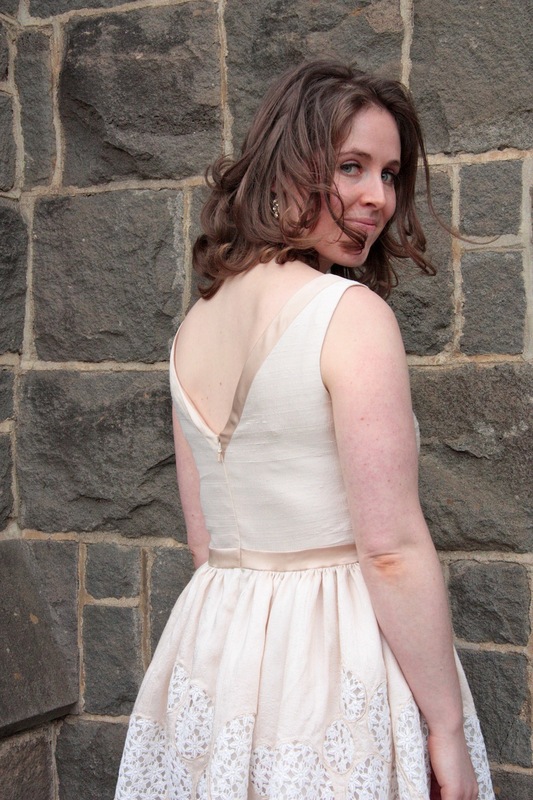 At the wedding I wore this dress to, I counted 6 women wearing dresses that the centre back zip was coming down on because there was no hardware to help provide that stability at the back. Funnily enough, they all were on either rounded or V-shaped dress backs. I pointed out so many to my beau that even he started to point them out and was tut-tutting along with me. Basically a happily ever after. And on that note, I will be leaving a radio silence until we have moved and made our new home slightly more liveable than what it currently is. My sewing stuff is already packed away in boxes, and I’m feeling quite sad knowing it will be a while before it sees daylight again. I will be looking forward to finishing and then sharing with you all the two jackets I have in mid-progress from winter last year! You have created a truly beautiful dress. The colours are so luxuriously subtle and the mixture of textures are simply gorgeous. Well done on a tricky circular cutout too. Thanks Bernice :) It does feel lovely to wear, even if I think I made it a little tight to start with. The cutout was definitely an experiment, luckily for me it worked out! I like the brooch effect. Simple but really lovely! The colours and textures are fabulous and that back v neck is great. I also love how the bodice cutout looks like a brooch! Very beautiful. Well, just amazing actually. Those colours and textures are gorgeous, and timeless. Good luck with the move and renos. We started our brand new house hunt today. It has taken me a full year to calm my nerves after our last renovation. This dress is gorgeous on you. 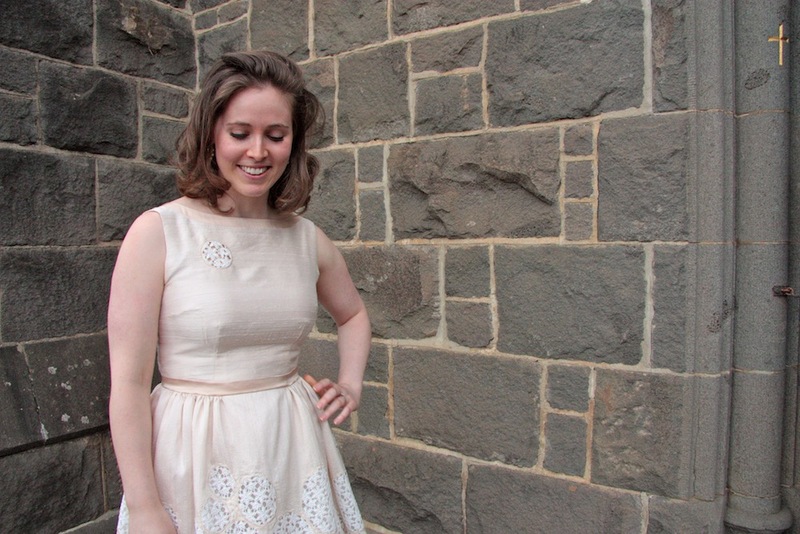 I’m so intrigued by how you added the circle applique on the bodice–I never would have thought of that! It sounds like you had so much fun wearing this–that’s the best part of sewing! I’m in love with the little circle on the front, beautiful! So stunning! I love the lace applique and have saved this post so I can attempt it myself one day! Thank Anna, you’re making me blush :) The other side, indeed. You’ve really done justice to that beautiful fabric – it’s a gorgeous dress. Your dress is brilliant – love the detail and fabric. Enjoy the close-ups you show, they’re very helpful. The skirt seems to have some sort of lining, what fabric did you use? Fit was also great, congratulations! This is seriously awesome! A great frock indeed! Gorgeous! Just love the fabrics and the colours. Makes me wish I had a wedding to go to. Sigh. Your dress is stunning. I love the subtle colours you have used which blend beautifully. The cut outs are gorgeous and must of taken ages to do. Classic, elegant & simple. Excellent colours & beautifully executed work as always! Gorgeous dress.The fabric is amazing, and your skills too! Even your ‘back to basics’ dresses are works of art! Timeless beauty. Good luck on the renovations, Enjoy creating your home! Thank you Marianne, we will! This dress is simple, but lovely. I love all the details you’ve put into this dress. I love your work. I admire your skills! Wow! Absolutely gorgeous! Beautiful work, a work of art really. What a wonderful dress to commence a hiatus with. Looks gorgeous. Good luck with the renovations! Hopefully it will tide me over until I’m able to sew again! I think I’ll be breaking into my boxes containing the contents of my sewing room sooner rather than later ;) Thank you so much! Gosh you look lovely! Those false eyelashes are doing amazing things to your eyes! Your dress is gorgeous – and I love the contrast silk. Do you have a resource you refer to for stitching thecarmholes? Good luck with the renos too! You are certainly a couture dressmaking force. Wow! A Masterpece or should that be Mistresspiece? Madampiece????? Any way it’s beautiful. Haha, I love it when we try feminising words for the first time, they always sound odd, but appropriate! Love it. Thanks so much, Caroline – we will! Somehow you always manage to turn even the simplest of patterns into an artwork! I love this dress on you. Beautiful fabric! Impeccable workmanship. An absolutely gorgeous creation. I hope you get to wear this beautiful dress many times in the future. Thank you so much, Margaret, I hope it will see events over many more years to come! Gorgeous – I don’t think you can call it simple though with all the hidden work you’ve put into it! Thanks Kristy :) I guess the simple reference in my head was referring to the pattern, which has sort of been eclipsed by being a perfect canvas for all the little sewing details I love to do! 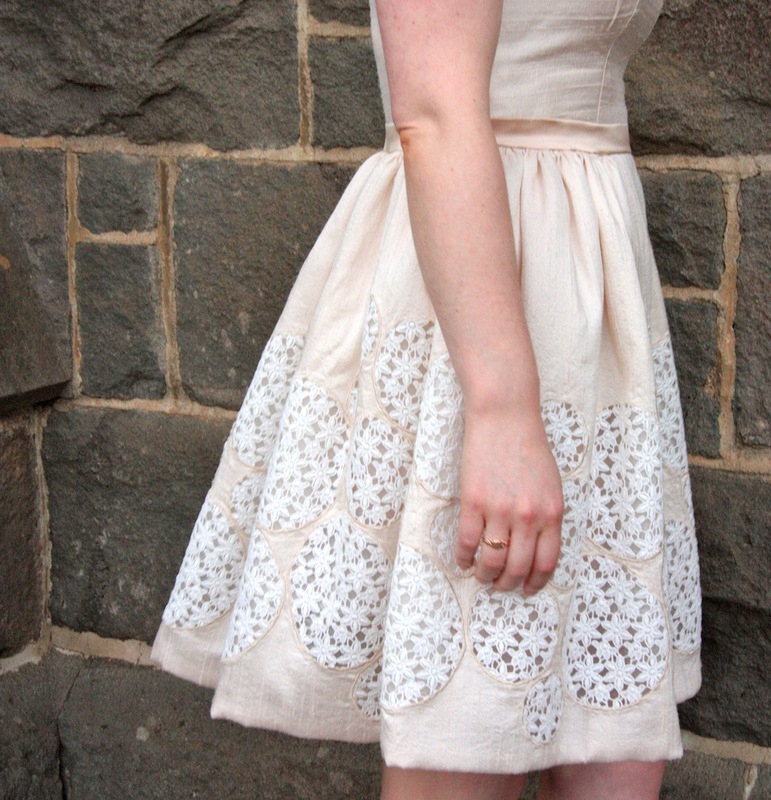 i love that you call this basic when it’s got all that hand-sewing care and that beautiful round appliqué cut out. Simply gorgeous fabric and the perfect project for it. 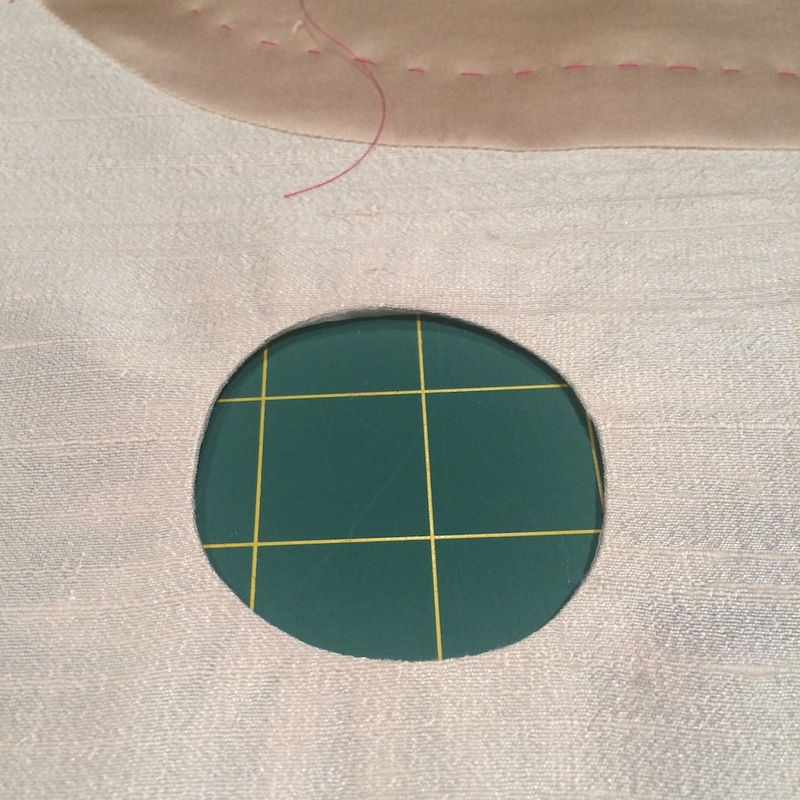 Thanks for the tip on leaving bigger seam allowances and hand-sewing seams to make late adjustments easier – one to bear in mind for special occasion frocks. Never hurts to have a bit of an insurance policy for a special occasion frock! Especially as it already appears from the photos that it’s extremely fitted, haha. But yeah, the name of this post probably isn’t really appropriate… It was a lovely, basic ‘blank canvas’ pattern to include all the little things I so enjoy seeing :) thanks Katie! This dress is just beautiful! I love the earthy quality of the raw silk, and those embroidered inlays are incredible; the simplicity of the cut of the skirt really makes your use of the border detail shine. The charmeuse is a nice touch, too! Yep, those are my favourite things about that fabric, too :) Glad you like it as much as I do – thanks Mads! Absolutely gorgeous! I also really appreciate that you take the time to explain all the little extras you add to your pieces. Gives me something to aspire to! Beautiful! The soft muted pink is just gorgeous. What a luxurious dress. I love this dress! I love everything about it, but especially your brilliant idea and execution of that lace insert in the bodice. That small detail adds so much to the overall design. So, I keep wondering what color shoes you wore with this to the wedding? Simply gorgeous! I just love all of your attention to detail. Isn’t it just the most amazing fabric to have against your skin? I don’t think there will ever be a point in my life I won’t be head over heels in love with charmeuse :) thank you, Kate! so pretty, and I noticed that you left an ungathered section at the center front of the skirt – clever you. I think this is such a great detail on a style like this, I have done it and it think it makes a gathered skirt look a bit more grown up. I would never have figured out what to do with this fabric so congrats, lovely. Thanks Beth :) I can’t recall where I first read about leaving an ungathered section at the front, but it has really stuck with me. If I hadn’t been reading your wonderful blog for a while, I would have laughed at your title “Back to Basics”, in reference to a Marfy dress made of silk dress with lace appliques. For most of us, your gorgeous dress is high glamour. Haha, yeah, you’re absolutely right really. Thanks Ann! My goodness, this is beautiful!! That fabric is so amazing, and though it’s a simple dress your care in making it really lets the fabric shine! Best wishes on your move – may it be as easy as possible! Thanks for the wishes Kelly, the closer it gets, the more anxious I am about how we’re going to pull it all off! It’s quite a challenge to find a pattern to suit a fabric with such a distinct personality… Hence the ‘basic’ pattern ;) thanks so much! Oh, Mel, this is so lovely! It’s so, so classic and pretty. Love it on you!!! Happy new home! Hope the move is smooth and simple! What a gorgeous dress – stunning! Good luck on the move and renovating. Such a beautiful dress. Absolutely stunning! Thanks Inna, I will do! yeah. totally basic. when i go basic, i always recreate already exceptional fabric into brand new droolworthy yardage. and then make a perfect dress out of it, natch. YOU ARE AMAZING. Oh, good lord, I wouldn’t call that simple! Beautifully constructed with great technique. And it looks lovely on you! Enjoy! Thanks Julie! I guess it started out as a very basic pattern… and I just couldn’t help myself by making all the little extra’s (my favourite part of sewing). I will! Gorgeous dress and love seeing all the details you have put into it. The fabric looms divine. Good luck with the move and renovations. Great techique brilliantly applied. The finished dress is so pretty. Mel, this is gorgeous! I can totally see it as a sheath frock as well- such lovely lines! And best of luck with the move and reno starts- it is so much fun but oh so tiring. Yay for homeownership! We’re both super excited and impatient to get stuck into it, I’m sure a few weeks in I’ll be wishing it to all be over! Thanks Sue :) the fabric looks even more lovely in real life! Melanie, this is so stunning! Your makes always make me swoon! The fit is absolutely superb! I can’t believe you only made one fitting adjustment, as that bodice looks like it was draped directly onto your body! And those fabrics are just gorgeous. That pale, tea-rose-y pink is beyond flattering, and as always, all your attention to detail has me drooling. That appliquéd lace on the bodice?!?! Girl, you’re a sewing goddess. Swooning just a bit here! You make a simple dress just spectacular with your attention to detail. I am completely smitten with your lace brooch! Sheer genius! Sooooo gorgeous! Crazy to me that you call this “basic.” I am loving that raw silk and all of your fine attention to detail. One of goals for this year was to slow down and take my time on my makes so they come out more nicely… this dress is a good visual to me of what I can accomplish if I really put in the extra effort. Oh absolutely… I love me a bit of slow sewing :) Thank you so much, Elle! What spectacular fabric! Love your little applique addition to the bodice. What a beautiful skirt! I love the lace, and all the other details you have added! Although it doesn’t look all that “basic” to me, I do know what you mean as I remember switching back to a “normal” sewing project after spending months and months making my wedding dress! This dress may not be the most complicated you’ll have done, but it is still stunning, and you look lovely in it (as usual!). You have done a beautiful job with this, loads of really nice touches, the lace insert in the top, the contrast waist and neck, organza and silk. Lovely. I’m all about being festively plump! Having just got back from a very indulgent week holiday with my family, I’m feeling it. Hope your move went well – I know it’s been disgustingly hot in Brissy lately! Wow! The dress is just absolutely stunning! I have always tried to figure out how to incorporate lace into my more basic fabrics, and your technique was so inspirational! I can’t wait to break out my fabric stash and see what I can make now. Thank you for the great post; I look forward to reading more. It’s a winner of a technique for using up scraps of lace, or just working a teeny bit of a lace detail into an otherwise simple garment :) Thanks Kat! Wise of you to leave the fit insurance. I have made myself a couple of “party” dresses in the past, some before having kids, and I WISH I would have left fit insurance in them. I spent so much time on them, they were such lovely fabrics, and I love them so, I still have them in my closet – even though they no longer fit! this is so gorgeous! I love the charmuese details on the outside of the dress. Great job! Oh, that fabric… I think you picked the right sort of pattern for it! It looks special even if it was a simpler sew for you. I’m curious, do you leave wide SAs throughout the garment, or do you pick certain seams you think you might want to adjust? Best luck with your move! 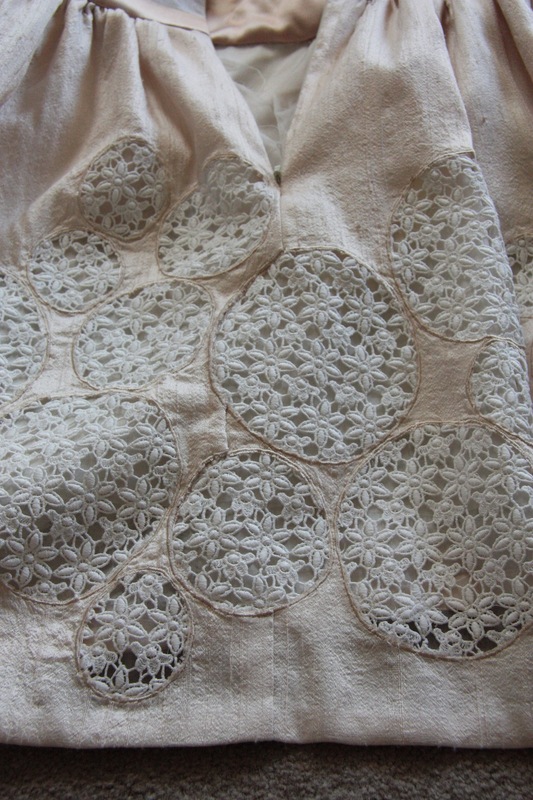 Lace inserts, all different sized circles, all arranged in a pattern…who knew it would turn out so lovely! Great fit and great flare and flattering with a flat front in the skirt. Best wishes on you settling in the new house. Thanks so much, Sandra :) Yay for hand stitching! Wow this is gorgeous. Anything but basic I’d say! haha, yeah I know… epic fail on my behalf on naming this blog post, I’d say ;) Thanks Meg! Absolutely exquisite job. I really admire your work! Thank you so much for sharing. It’s really gorgeous and i loved how you’ve planned ahead to make it always wearable! The ‘brooch’ detail is beautiful too. I’m finding as I (sniff) get older that I’m questioning full gathered skirts on me…… If I want gathers I tend to find patterns that have only lightly gathered skirts or just in the centre front…..
I’m hearing you on the gathered skirt thing – previously I’ve loved them to bits, but this dress had me on the fence. I still enjoyed wearing it… but can’t help shake the feeling that it’s now out of my age appropriate bracket. The only thing defining that is how I feel about it of course, but I can definitely see myself converting this into a sheath dress in future. Thanks, Sarah! Haha basic you crack me up. But you are one clever cookie. I love this! Yeah I totally missed the communcations mark there… the simple was in reference to the pattern (5 pieces! whoo! ), and not the web of complexity I weaved in and around it ;) haha. Thanks! 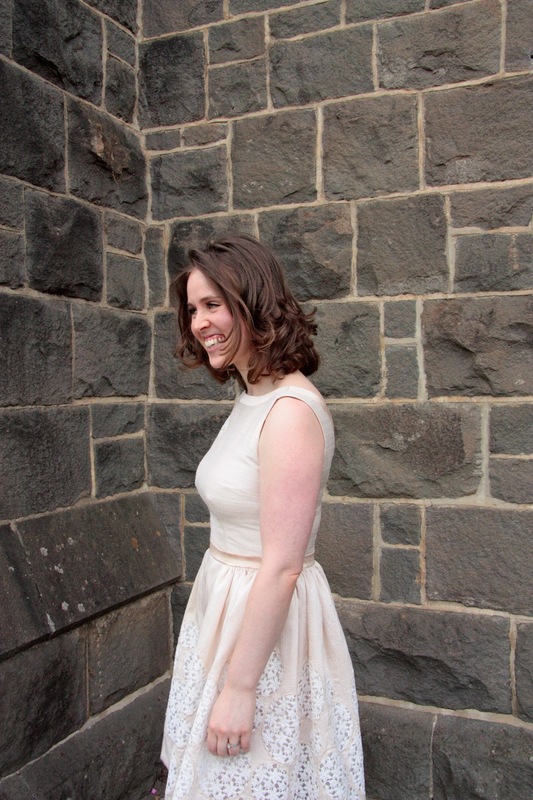 Mel, that is so NOT a basic dress – the fabric, your sewing, and your amazing cutouts elevate it beyond a simple fit and flare dress – but I guess it is relatively simple compared to your wedding dress! Anyway, basic or not, it’s absolutely exquisite and super elegant, and I want one too! Beautiful! 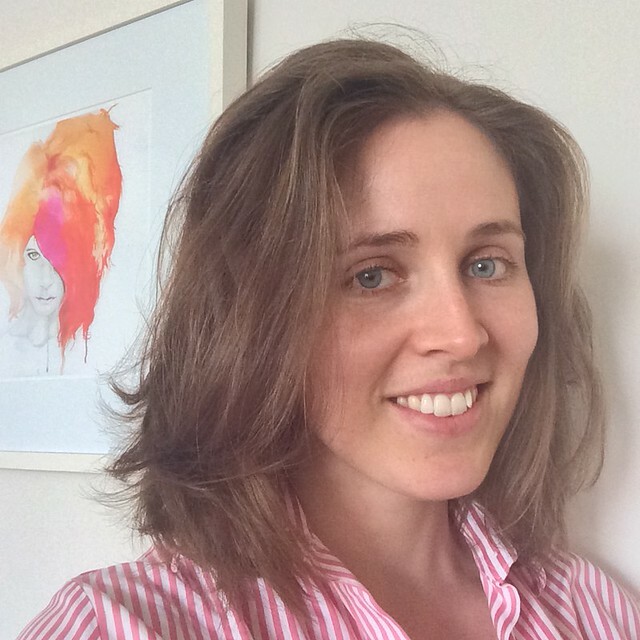 Just found your blog through Madelynne’s Best of 2015. Can’t wait to follow you into summer!